This growing family was in need of more bedrooms when they called in our team at Monk’s to build one in their already finished bedroom. In just two weeks our team framed out a wall and closet, sheetrocked the room, and gave it all of the finishing touches of baseboards, door casings, window casings, and a full interior paint job. Our team also enlarged an existing window to make sure the space had an emergency exit and would meet all fire codes. The first step our team took in this project was to create the egress window. An egress window is an important component of any basement bedroom. An egress window is a window that is large enough to act as an emergency exit. Fire code requires the window to be large enough for a fire fighter to fit through it with all of his equipment on. This space already had a window when our team arrived on the job, but it was not yet large enough to serve as an egress window. 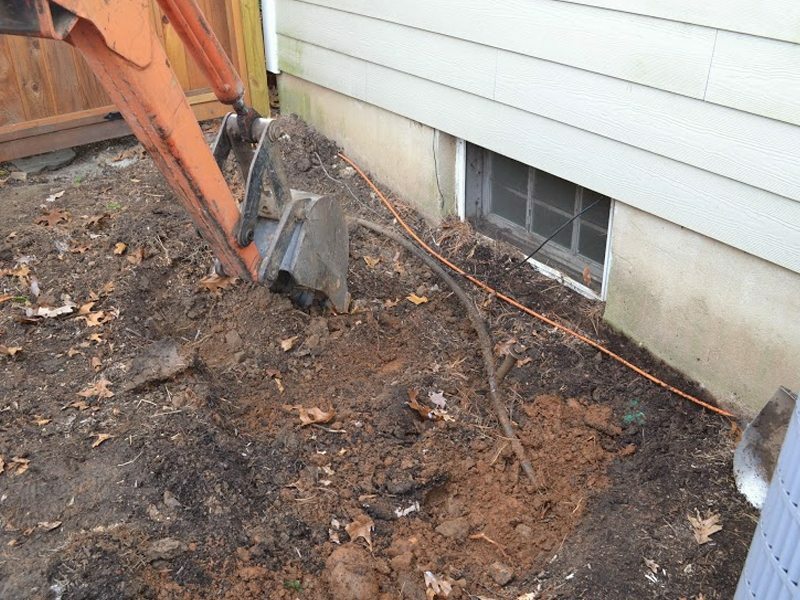 Firstly, a well was dug outside of the existing window to create the large egress window. To ensure that the newly dug well would not flood and cause problems for the new renovation our team ran a piece of PVC pipe from the well to the front of the house, draining any emerging water away from the house. Once the space was tested and it was clear that creating the egress window would not be disturbed by flooding issues our team could cut into the foundation and enlarge the area needed to create the new larger window. Now that the egress window was in place our team could take to the interior carpentry. Our team of carpenters framed out the walls for the new bedroom, as well as a new closet. During this time a team of electricians also came into install wiring for new ceiling lights. Then the next step in the project was to sheetrock the walls. Since this is a basement project, our team used green board, which is a water resistant material. Once in place, it was taped and spackled. To give this new basement bedroom an even more complete and finished look our team installed new baseboards, as well as new window casings, and door casings for the newly installed door. Finally, to maximize the amount of storage space, our team at Monk’s created a custom recessed drawer unit. This unique utilization of space, and the built in closet would provide plenty of space to store clothes and other belongings. Once all of the carpentry work was done our team gave the new basement bedroom a full interior paint job. Therefore, we applied a coat of primer followed by two coats of interior paint. In only two weeks our team transformed a portion of this Chatham, NJ basement into a bedroom! Other Types of Work: custom built in project, crown molding installation, floating hard wood floor installation. To discuss your remodeling project and receive a free estimate, call 973-635-7900 today.